A Z Nation prequel set in official continuity of Syfy and Asylum's #1 hit zombie television show created by Karl Schaefer and Craig Engler! A year after the zombie virus outbreak, a devastating drought and famine set in, killing most of the human survivors. As the remnants of humanity cling to existence, Charles Garnett sends a new team on a desperate quest: Retrieve a possibly untouched cache of the food substitute Soylent Z from Galveston, Texas. But when mission leader Israel Johnson and his small team arrive in Galveston, they'll face a threat unlike anything ever seen before in the zombie genre! 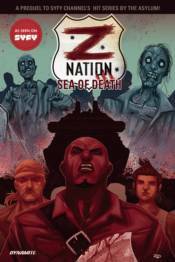 Featuring Z Nation's signature blend of horror, humor, and heart, 'Sea of Death' is a wild ride through the zombie apocalypse, as envisioned by series co-creator Craig Engler, comic book writer Fred Van Lente (Marvel Zombies, G.I. Joe), and artist Edu Menna (Red Sonja).